I promise: this is a different kind of Valentine. It’s no news that we live in a world with unattainable physical beauty standards for women, underscored by incessant chipper Hallmark-holiday messaging. The past week’s marketing onslaught happened to be specifically about how all women should all be in love, married, and/or decorating the perfect Pinterest-worthy cupcakes. These are my legs. They touch at the top. Yes. This is me standing with my feet “hip width” apart. Thighs still firmly touching. Stubbornly refusing to conform to fashion ideals, despite the 15-20 hours of skating and cross-training I do each week. Thanks, genetics. I can dig down into the track and stop the force of a jammer coming in hot. I can drive forward against a wall of blockers. I can squat more than my bodyweight. Thanks, Derby. I can stride around the track or down a shoreline path and feel the wind in my face. I can be nimble and agile, and take flight across the apex. I can feel every muscle working to propel me forward and hug the turn – glute, inner thigh, outer thigh, quad, hamstring, calf, foot – as I grind out each crossover. Every fiber transmits force through my skate to the track. I will never fit my calves into those Hunter rubber boots everyone else looks so cute in. I will never look quite right in a stretchy skirt. But I will never worry about what my legs look like in gym clothes – because that’s what these derby legs were made for. They are never weak. They are never feeble. They never let me down. These derby legs of mine serve me well. And while I sometimes wish I didn’t wear out all my jeans at the inner thighs, I still love them a lot. 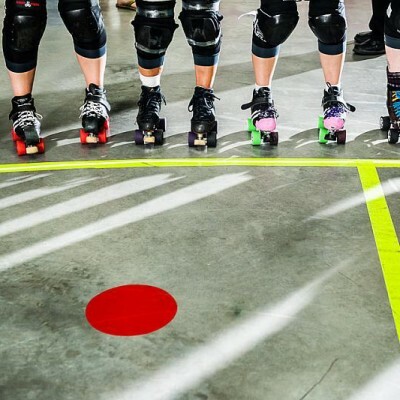 From these derby legs to yours: nothing but derby love. 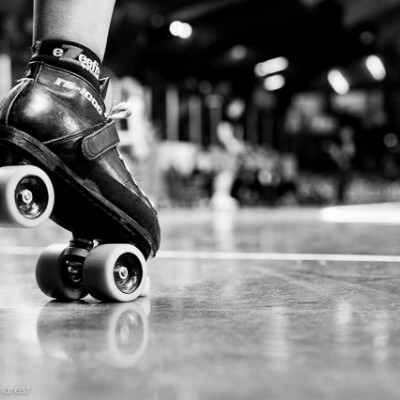 PS I wrote a Love Letter to Derby Legs in 2013… you might like that one too! Want More Derby Training Tips Like These? I found out the hard way about Hunter boots! But I love how shapely my calves are.